Just over an hour’s drive from Blairgowrie, via the A93, you’ll find the Scottish Home of the Royal Family. 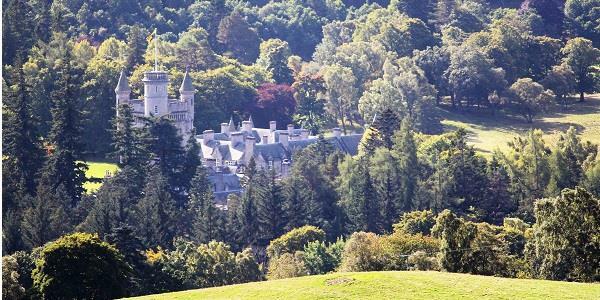 Ever since its purchase in the 19th Century, Balmoral Estate has been a frequent favourite of the Royals, and its rich history continues to fascinate visitors today. Even if the Royal connection doesn’t grab your attention, the castle’s breathtaking grounds and gardens are sure to do the trick. Even the drive from our Witch’s Pool property to Balmoral is magical. Taking you through the majesty of the Cairngorms, you’ll be spellbound by the thick, lush greenery, catch glimpses of famous Highland Cows and might even have to stop the car to appreciate the stunning views across the mountain ranges. Once you catch sight of Balmoral Castle, surrounded by hills and trees, you’re bound to be captivated by this amazing part of the country. 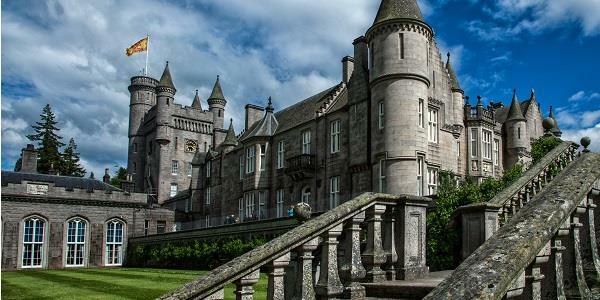 Balmoral Castle is nestled within the famous Cairngorms, Britain’s largest National Park. It was first purchased for Queen Victoria by Prince Albert in 1852, after they fell in love with Scotland during their first visit in 1842. Once purchased, they decided that the building was not in good enough condition to meet their needs and so commissioned William Smith, City Architect of Aberdeen, to rebuild it for their family. A new site was selected 100 yards North West of the original building, and the foundation stone laid by Queen Victoria on 28th September 1853 – it can still be seen today, at the foot of the wall adjacent to the West face of the entrance porch. There is also a cavity beneath the stone, where a bottle containing a parchment signed by Queen Victoria was placed. The Castle was finally completed in 1856, and quickly became a firm favourite for the Royal couple. After the death of Queen Victoria in 1901, Balmoral Estate was passed down to King Edward VII, and then to each of his successors in turn. Today the Queen, The Duke of Edinburgh and the Prince of Wales still take a keen personal interest in running and improving the estate. Balmoral’s grounds, gardens, exhibitions, gift shop and café are opened to the public on a daily basis during the spring and early summer months. This is usually between April and July (you can find the current opening dates here) before Her Royal Highness arrives for her annual Summer stay. At the time of writing, admission was £11.50 for adults and £6.00 for children. Family and Senior tickets are also available. We would recommend that you aim to arrive when the castle opens at 10am, so you can enjoy the views and perhaps take a few photos before the crowds gather. Set aside around 2 hours to explore the grounds, to make sure you have time to see everything on offer. Visitors can buy tickets from the small shop at the entrance gates, and then park their cars for free. Once you’re at the car park, the castle itself is either a 10-minute walk through the forest, or you can also catch the free shuttle bus. Please note that dogs are welcome in the grounds and gardens, but must be kept on a lead. An audio handset tour is also included in the ticket price, although a £5 deposit is required. The audio tour is available in English, Dutch, French, German, Italian and Spanish, and includes a good background on the Estate’s history, as well as interviews with some of the current staff. It’s also worth noting that, apart from the Ballroom, the interior rooms of the castle are out of bounds, being the private rooms of the Royal family. The ground and gardens of Balmoral are certainly the highlight of any visit, spanning for thousands of acres and bursting with flowers, forests and foliage – all cared for and beautifully maintained by a team of expert gardeners. The grounds are all clearly signposted, although you will also get a map with your ticket, so finding your way round is simple. 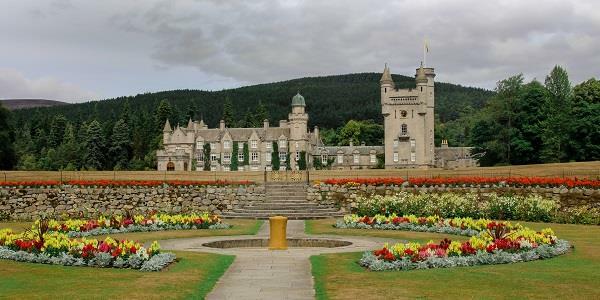 The gardens at Balmoral were originally started under the watchful eye of Prince Albert, and have since been expanded and improved upon by various members of the Royal Family. The charming garden, for example, was planned by Queen Mary between 1923 and 1925, with its circular wall of rocks and lovely water fountain. 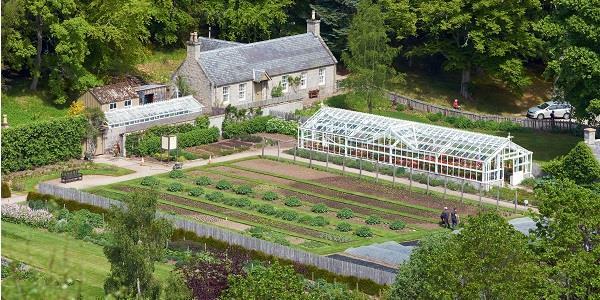 The garden has more recently been extended by the Duke of Edinburgh to include a large kitchen garden, which the gardeners carefully plan and maintain to ensure everything is ready to be harvested when the Royal Family arrives in August. Don’t miss the formal gardens during your visit. These span for around 3 acres, and contain plenty of lush greenery and well-manicured flowerbeds, as well as a selection of beautiful Victorian glasshouses and a conservatory. Here you will find various colourful displays of flowering pot plants throughout the year. There is also a water garden, which is well worth taking a relaxing stroll through on a sunny day – in such beautiful surroundings, it’s easy to imagine being royalty yourself! Garden Cottage is another hidden gem in the gardens. Originally built from wood in 1863, this was occupied by a gardener. However, two rooms were set aside for use by Queen Victoria. It was said she used to deal with State correspondence, write her diaries and even occasionally take her breakfast in the charming building. It was also used as an isolation hospital for Queen Victoria's Lady in Waiting when she was suffering from scarlet fever. By 1894 the wooden cottage was demolished and replaced by the current stone building. Since then, the interior and exterior have stayed surprisingly unchanged, apart from a little modernisation. Visitors cannot go inside, but the rooms can be viewed through the windows. Garden cottage overlooks the water garden, and the rose garden and conservatory are just a short walk away. Balmoral castle holds regular exhibitions, but some may say that the real star of these displays is the venue – the Castle Ballroom. The largest room in the Castle, it contains works of art by Landseer and Carl Haag, silver statues by Sir Joseph Edgar Boehm, Minton China and other artefacts from within the Castle. The ballroom is still used by the Royal Family today; in particular for the Ghillies Ball, which has taken place every year since Queen Victoria’s reign. Meanwhile, the Carriage Hall Courtyard contains another public display – in 2019 this focused on local wildlife. You can also find the Estate exhibition, which includes a short film about at Balmoral today and how the 50,000-acre Highland Estate is managed. As well as regular exhibitions, Balmoral holds numerous special events throughout the year, including Easter Egg Hunts, Pipers and Drummers, running festivals and self-drive 4x4 treks... there really is something for everyone! Every year the Rangers also offer a number of guided walks and luxury land rover safaris, which provide a fantastic opportunity to drink in the stunning scenery and learn about the local environment and wildlife from the experts. You can find a full calendar showing these, as well as plenty of other special events, here. With such expansive grounds to explore, you may find yourself in need of refuelling, in which case Balmoral Piper’s Café has a good selection of hot meals available, including vegetarian and gluten-free options. If you really want to get a taste of Scotland, why not opt for a meal of Haggis? All the food is prepared in the kitchens of Balmoral Castle, so you can sure it’ll be fit for Royalty! Just an hour away from Balmoral and 30 minutes from Cairngorms National Park, our Witch’s Pool property is the perfect place to explore the beauty of the Scottish Highlands. 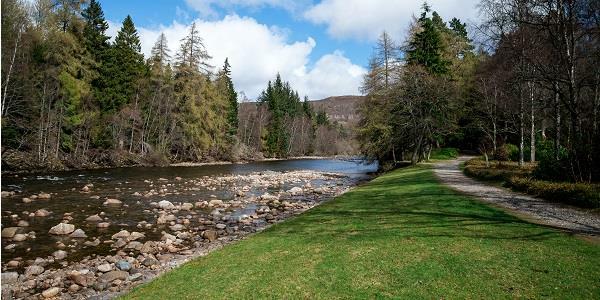 The two lodges are perfect for fishing holidays, but will be equally loved by anyone who enjoys spending time in the great outdoors, with high mountains, low glens, thick forests and crashing waterfalls all on your doorstep. We’d love to share the beauty of Scotland with you during a stay at Witch’s Pool. To learn more about how you can enjoy a holiday here, or at any of our other 31 properties, simply get in touch with our team.